This book provides valuable insights for the core business on how software development impacts profitability. It helps the core business understand how to communicate with software developers and reward the right behaviors. 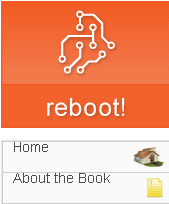 Reboot! is a new book that takes a fresh look at software development. It is informative, funny, witty, and takes a lively and engaging look at issues facing any software development organization. Reboot! is a passionate and provocative exploration of the problems organizations face when developing software. In addition to an interesting exploration of software organizations, this book examines disciplines such as music, architecture, and industrial design while extracting many applicable lessons for software development.